Welcome to Arrowhead in the Smoky Mountains! 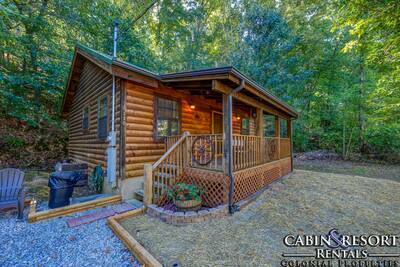 This spectacular 1 bedroom, 2 bath log cabin rental is waiting to embrace you in total comfort! As soon as you enter this vacation cabin, you’ll be mesmerized by the soothing natural wood tones and windows that frame the forest outside. The beautiful living room provides you with a soaring cathedral ceiling, deck access, fireplace, flat screen TV and a huge sectional sofa. The open floor plan allows you to enjoy the company and companionship of your traveling guests. Adjoining the living area is the fully equipped kitchen and dining area that seats up to 4 people comfortably. Just off the living room you’ll find the wonderful master suite. Here you’re treated to a king size log bed, flat screen TV, deck access and an en suite full bath with shower and an oversized jetted tub for total relaxation and comfort. Venture up into the second level of Arrowhead and you’ll find the gaming area. Challenge someone to an exciting game of pool or sit back on the sofa for a little R&R. On this floor there’s also a second full bath with shower for added privacy and convenience. 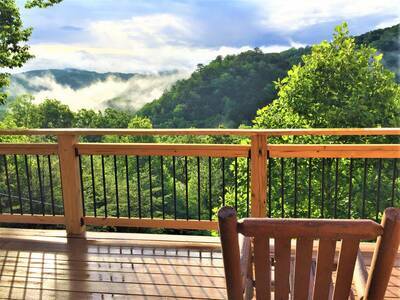 Head outside onto the full length covered deck to soak up a little sun and enjoy the crisp Smoky Mountain air. 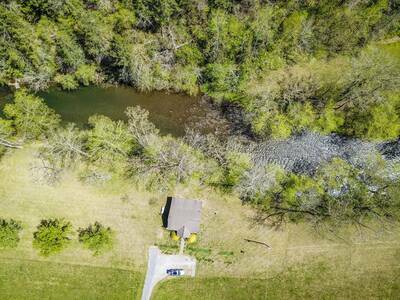 Here you’ll find rocking chairs and the ever so amazing bubbling outdoor hot tub. Conveniently located between Gatlinburg and Pigeon Forge and near the Great Smoky Mountain Arts and Crafts community, you’ll love being able to avoid the Parkway traffic when you’re headed into town. 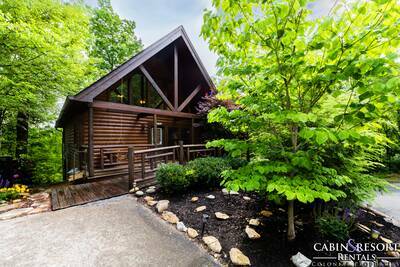 If you’re in search of a spacious cabin vacation rental with luxurious amenities that will make you feel right at home, Arrowhead is the place to be! Reserve your stay today! A: Hi Rupa! Arrowhead is not a pet friendly property. We do have properties on our program that are. A: Hi Tammy! It's a short 10-15 minutes drive away. A: Hi! Yes, there is parking directly at the cabin. A: Hi Tanya! Yes, there are over 800 miles of streams and rivers in the Smoky Mountain area. “ Loved the cabin. Comfy. Very relaxing. “ Thank you!! Our stay in Arrowhead was very nice and relaxing. 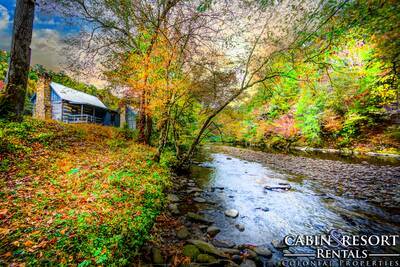 “ My husband and I booked this cabin for our one year anniversary, it was a nice romantic getaway. No problems! “ We celebrated our anniversary here. The cabin and surroundings were beautiful. Location was perfect. 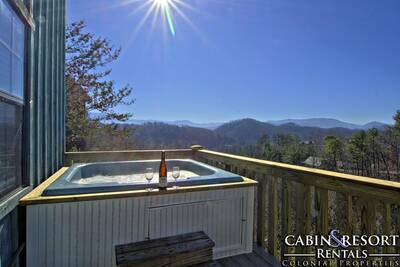 Nicel and private, but close enough to gatlinburg. “ I have never been so relaxed. I am a Director of nursing and am always stressed. Love it there. “ Area was nice and quiet, beautiful woodland views. The cabin smelled like wood and was very welcoming. It felt like home away from home. There was plenty of space to relax and unwind. Our favorite attractions in the area was the Davy Crocket Mini Golf, the black light mini golf at lazerport, the Titanic Museum, and the Aquarium. The local shops were also very fun and inviting. It is definitely worth the trip out and we would love to come back!